Other number 7223 11006 E2 On th IBM property tag on the left interior of the machine. Serial number 1106 Found in the customer engineerig incident reporting log book. 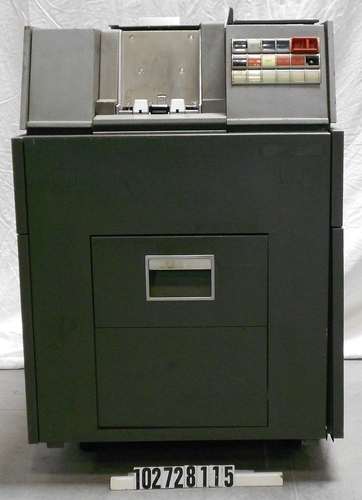 This object is part of the IBM 7094 system donated by Paul Pierce. The cards are through the front and extruded from the top of the machine. The reader is two toned with a medium dark gray at the bottom and a lighter gray at the top. The panels are released by pressing in a pair of flush release buttons, which allows them to drop down on a hinge. The front panel can be lifted off completely. At the front in the top right corner there are three rows of command buttons and a large red switch. There is an orange paper sticker inside at the back that reads, "Ontario Hydro Electrical approval by special inspection - series W." There is also an IBM coverage sticker on the external side of the back panel with the type and serial number and the that the unit was owned by the University of Toronto, Dated March 1st 1969.